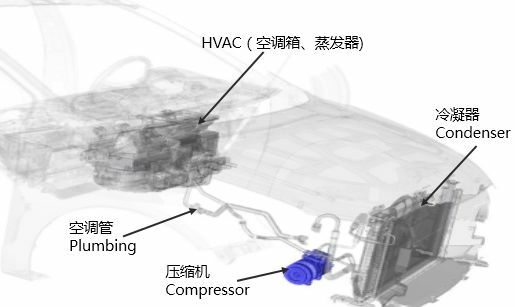 Root cause for auto air conditioning compressor not work include compressor jam, fuse open circuit, refrigerant leakage, low battery, vehicle control protection. Customer complains about A/C not work, hot wind, smog from engine chamber, smelly or engine shut down when A/C on. Compressure jam or seizure can cause engine shut down when A/C on, smelly or smog. If these happens, it is more likely that compressor has jammed. Compressor or even the whole A/C system need to be retrofitted. Visual check compressor. If burnt rubber debris found around compressor, it should be jammed. Check compressor fuse. Check whether open circuit. Check refrigerant pressure. Stop engine for about 10 minutes. Poke needle vavle on high pressure A/C plumbing.If no obvious pressure relief, leak of refrigerant confirmed and leakage caused compressor can not work. Check compressor power voltage. Compressor clutch need 9V+ power to work. Check whether low battery, engine speed too low, engine temperature too high, A/C system high pressure too high. In these case, vehicle calibration don’t allow compressor to function. After these steps, you have confirmed a compressor issue. Change a new one. General Air Conditioning noise complain include outlet wind noise, refrigerant hiss noise, blower noise, engine cooling fan noise, engine noise and then compressor noise. Customers’ description always shows noise when A/C on. No clear distinguish. Here I just want to discuss compressor noise. Compressor noise include clutch engage/disengage noise, idle condition big noise, specific engine speed big noise, sweep speed noise and abnormal noise. Firstly, follow these steps to confirm noise heard from vehicle cabin is from compressor. Is A/C On noise only occur at the time switch A/C on? A “clap” noise happen at once A/C on could be clutch engage noise, which is a normal situation. Check whether same vehicle model has same noise. Is A/C On noise happen durring a short time after A/C on? Maybe 10s or 20s after A/C on. If “hiss” noise happened, it is a refrigerant noise mostly caused by refrigerant leakage. If “buzz” or “tick tock” noise happened, it could be a compressor noise status when work condition is haven’t got into stable in a short time after A/C on. Then check whether same vehicle model has the same noise. Is A/C On noise happen all the time when A/C on? Compare with other vehicles. Is A/C On noise happen at a specific condition? Maybe a specific engine speed. It could be a normal status. Compare with other vehicles. Is A/C On noise happen when accelaration or deceleration? It could be a normal status. Compare with other vehicles. Keep in mind that A/C on not means compressor working. In some cases, like engine speed to low or engine temperature too high, compressor can not work even you have put to A/C on. Compressor noise can be a signal of compressor jam. Retrofit compressor when you confirmed noise is from compressor to avoid worse situation.